Things are heating up in Group B of the Asian Qualifiers. On 30 August 2017 at 2.30AM AEST, UAE entertain Saudi Arabia at home. On 31 August 2017 at about 8.35pm, the Socceroos travel to Saitama for a must-not-lose clash against Japan. On 5 September 2017, Australia play Thailand in Melbourne; at 3.30AM AEST the following day the Saudis host Japan in Jeddah. I explore the various scenarios below. We can discount UAE now because they need to win against Saudi Arabia to have any chance at all. It is very unlikely that Australia can scrap a win in Japan (History does not agree with this prediction). If they do however, then in the above scenario all the Socceroos will need is a draw against Thailand to finish on 20 points (16 + 3 + 1). Japan and the Saudis will be stuck on 17 and 19 respectively. Regardless of who wins or draws in that final encounter in Jeddah, Australia is safe as houses on 20 as both teams cannot surpass or equal 20 points simultaneously. In this scenario, Australia need to beat Thailand by any margin to reach 20 and progress. Regardless of the result in Jeddah, Australia on 20 will go through as both teams cannot surpass or equal 20 points simultaneously. This is a nightmare scenario, but is also quite possible. If this happens, Japan shoots up to 20, and the Saudis are on 19 with a superior goal difference to Australia's. If Japan and Saudi Arabia collude for a draw, both will go through on 21 and 20 respectively at the expense of Australia stuck on 16 as Australia can only reach 19 at best. It could be the Disgrace of Gijon all over again. If this happens, Australia can automatically qualify for the World Cup if they beat Japan! A tally of 19 is not surmountable or capable of being equalled by both Japan and Saudi Arabia, given that they play each other in the final match. If Australia draw to Japan, a variation of Scenario 1b plays out again (Japan -18, Saudi Arabia - 17, Australia - 17) and any win against Thailand will do. 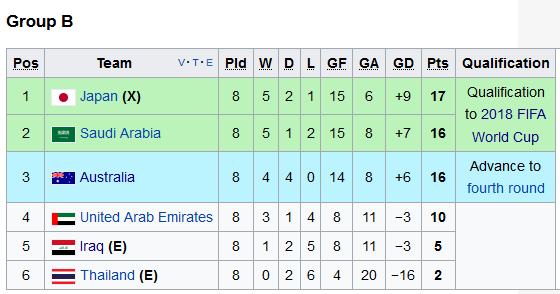 If the Saudis lose to UAE and Australia draws with Japan, then a draw against Thailand will only work if Saudi Arabia get nothing more than a draw from Japan. Of course, this is risky and drawing to Thailand again should be avoided at all costs. If the Saudis lose to UAE and Japan wins, Japan qualify. Australia is in a difficult position then because Japan have nothing to play for in their last match against Saudi Arabia. I will talk about this scenario another time if it does get to that, but hopefully I won't need to. My hope is that Japan and South Korea both finish 3rd in their respective groups and play each other in the play-offs, but that is a very unlikely scenario. This would require Uzbekistan to break their duck against the South Koreans after unluckily missing out to the same in the 2014 qualifiers on goal difference! Uzbekistan would probably also require Iran (who have already qualified) to take the match against South Korea on 31 August seriously. Kind of unfair really since the Iranians will probably field at least a semi-experimental lineup. The last important match between these two Asian juggernauts was in the semi-final of the 2011 AFC Asian Cup. I think this heavyweight rivalry needs to be given a a real stir. How could one forget the Agony (Tragedy) of Doha (or the Miracle of Doha if you are South Korean) in 1993, and the following Joy of Johor Bahru in 1997? Ask a Japanese or a South Korean who lived during those days! Scenario 1b or 1c. It's almost a coin flip.